Lantek is celebrating. Since its creation in 1986, the multinational has surpassed the figure of 18,000 customers in the more than 100 countries on the five continents where it is present. “We are very proud of this achievement that we have managed with the help of the entire team at Lantek. We would like to use this occasion to thank each and every one of those 18,000 customers for their trust. Without them, Lantek would not have reached this position of global leadership in CAD/CAM/MES/ERP software solutions for companies that produce metal parts from sheet metal, tubes, and profiles using any cutting (laser, plasma, oxy-fuel, waterjet, shearing) and punching technology” explained Juan José Colas, Commercial Director of Lantek. This highly important milestone in the history of Lantek has been reached in the year Lantek celebrates its 30th anniversary. It has been three decades of leading the sector, thanks to its commitment to innovation and to listening to the customer in order to adapt products to their needs and help them to be more competitive. “Since our creation, we have had a clear commitment to international expansion. 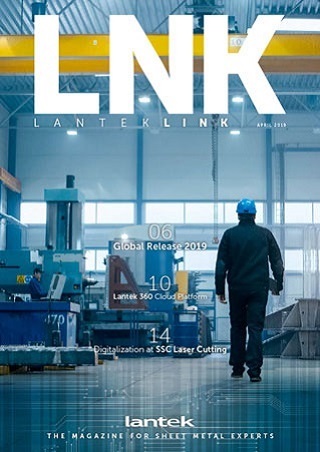 This excellent figure is a result of our effort to reach more markets and customers with the different solutions that Lantek provides,” pointed out the Commercial Director. Last year, Lantek grossed more than 18 million euros, an increase of 16% over the previous year. Of this figure, more than 88% of the business corresponds to customers outside Spain. The countries where Lantek has the most customers are: China, Spain, Italy, Korea, France, Brazil, and Germany. Its capacity for innovation and its firm commitment to internationalization and emerging markets have led Lantek, founded in 1986 in the Basque Country and with central offices in Vitoria-Gasteiz (Alava), to devise a global-local strategy, which has meant it has become a global reference within the industry with its CAD/CAM/MES/ERP solutions. Today, the company has over 18,000 customers in over 100 countries and its own offices in 15 countries, in addition to an extensive network of distributors that are present throughout the world. In 2015 its international operations provided 88% of its turnover.